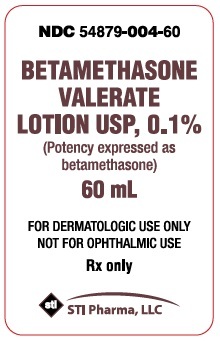 Betamethasone Valerate Lotion contains betamethasone valerate USP, a synthetic adrenocortico-steroid for dermatologic use. Betamethasone, an analog of prednisolone, has a high degree of glucocorticoid activity and a slight degree of mineralocorticoid activity. Each gram of the 0.1% Lotion contains 1.2 mg of betamethasone valerate (equivalent to 1 mg betamethasone) in a vehicle of isopropyl alcohol and water slightly thickened with carbomer 934P. 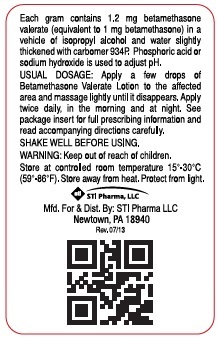 Phosphoric acid or sodium hydroxide is used to adjust the pH. Topical corticosteroids share anti-inflammatory, anti-pruritic, and vasoconstrictive actions. Topical corticosteroids are indicated for the relief of the inflammatory and pruritic manifestations of cortico-steroid-responsive dermatoses. Therefore, patients receiving a large dose of a potent topical steroid applied to a large surface area should be evaluated periodically for evidence of HPA axis suppression by using the urinary free cortisol and ACTH stimulation tests. If HPA axis suppression is noted, an attempt should be made to withdraw the drug, to reduce the frequency of application, or to substitute a less potent steroid. Parents of pediatric patients should be advised not to use tight-fitting diapers or plastic pants on a child being treated in the diaper area, as these garments may constitute occlusive dressing. Carcinogenesis, Mutagenesis and Impairment of Fertility: Long-term animal studies have not been performed to evaluate the carcinogenic potential or the effect on fertility of topical corticosteroids. Pregnancy: Teratogenic Effects—Pregnancy Category C. Corticosteroids are generally teratogenic in laboratory animals when administered systemically at relatively low dosage levels. The more potent corticosteroids have been shown to be teratogenic after dermal application in laboratory animals. There are no adequate and well-controlled studies in pregnant women on teratogenic effects from topically applied corticosteroids. Therefore, topical corticosteroids should be used during pregnancy only if the potential benefit justifies the potential risk to the fetus. Drugs of this class should not be used extensively on pregnant patients, in large amounts, or for prolonged periods of time. Pediatric Use: Pediatric patients may demonstrate greater susceptibility to topical corticosteroid-induced HPA axis suppression and Cushing's syndrome than mature patients because of a larger skin surface area to body weight ratio. Apply a few drops of Betamethasone Valerate Lotion to the affected area and massage lightly until it disappears. Apply twice daily, in the morning and at night. Dosage may be increased in stubborn cases. Following improvement, apply once daily. For the most effective and economical use, apply nozzle very close to affected area and gently squeeze bottle.